There is no time to think, no time to plan. There is only time to act as it slowly approaches you, sniffing, scanning, and hunting. It knows you’re there and it’s only a matter of time before it finds you and begins to feast. Confronted with a shocking and horrific new world in which a contagious virus is suddenly transforming people into vicious predators, 17 year old Jack fights to lead his friends and family to safety. After narrowly escaping the city, Jack travels the apocalyptic USA in search of a safe haven. Along the way, he meets other survivors, including Kevin, a pessimistic lawyer with a phobia of “zombies”, and Steve, a former Navy Seal. Surprised at the terrible things he finds himself willing to do to survive, Jack struggles with his sense of morality. Constantly thrust into deadly situations, he makes quick decisions that determine the fate of others around him. Ultimately, Jack and the other survivors must ask themselves: is it possible to rebuild after such a widespread catastrophe? If it is possible, is it really worth it? 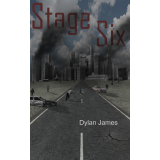 At 200 pages long, Stage 6 is a thrilling adventure that explores what a modern “zombie apocalypse” might look like if it happened tomorrow.